I love a good gallery wall (if you follow me on Instagram you already know that!) and I have to admit I'm pretty proud of mine. But it's not something that happened overnight. It has been collected & curated over 3 years and it's still not quite finished - there's a good chance it never will be 'done' - but I've learned a lot along the way. Wherever you are, remember that all good things take time. This gallery (which, lets be honest, is so not important compared to many things) took over 3 years. And there were many moments of not-so-pretty (and more than a few extra holes in the wall) to get it to this point. Things take time - nothing in life happens overnight. So keep asking and seeking and working, you'll get there soon. All the photos I could find of my gallery over the past 3 years - along with my thoughts on collecting & curating your own gallery are below. The two prints that started it all. I bought these prints from Leigh Viner during a holiday sale after admiring them for years. Here's another shot from mid-2012 - link. Hopefully you can see the evolution in the photos above, but it grew pretty slowly. At one point, I decided I was not happy with the arrangement, so everything came down and I planned it out with paper. I mixed up the frames, the type of art, and the colours to try & achieve a more 'balanced' look. Below are some daylight shots (and so you can see the blue I used to have!) and the reason you usually don't see my desk - haha! Thankfully I have more storage under my desk now so it doesn't get that bad, but oh man.
! I purposely made sure I liked the frame arrangement before I painted so I could fill in all the holes I'd made over the years. The soft grey has made the biggest difference, and I could not be happier with how it turned out! // Pick art that you love, that speaks to you in some way. It will all come together. // Try different 'mediums': photography, illustration, paintings, originals, text, etc. // Let it grow organically. Start small, & build as you go. to see the updates I've been working on. 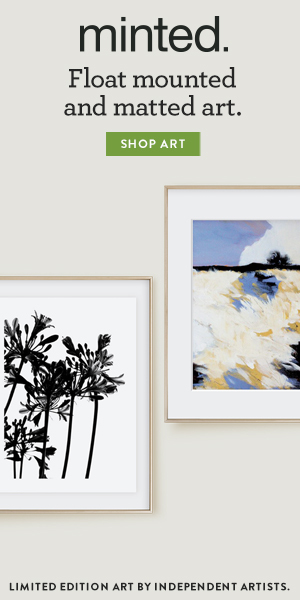 Where do you stand on gallery walls? If you've got one of your own, share a link in the comments or tag me on Instagram. I would love to see!